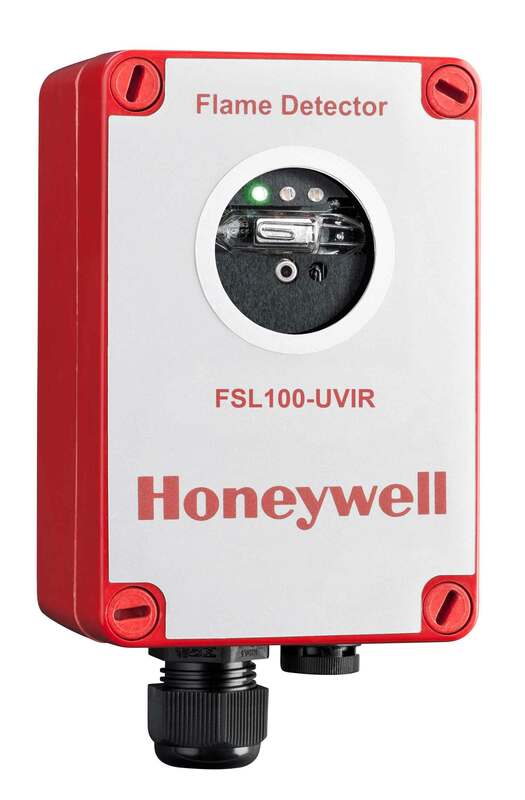 Honeywell’s FSL100 range of Light Industrial/Commercial Flame Detectors enables simple coverage of fire hazard areas across many fire hazard applications. Installation, set-up and operation are simple. Wide solid area coverage and fast speed of response omtimize safety. With inbuilt automatic test and test lamps available to cover all models, reliability is ensured. 4 to 20mA and Relay outputs. The newest Optoelectronic flame detector for a wide range of Light Industrial fire detection from Honeywell Analytics. Detecting a wide range of Hydrocarbon and Non-Hydrocarbon flaming fires means that many application areas can be addressed. Optical detection of radiant energy in a solid angle Field of View enables coverage of a large risk area. Simple optional mounting bracket allows the FSL100 to be installed and aligned covering the hazard. Far faster than other technologies, by responding to flaming fires in seconds enabling a more rapid response to danger before the fire can escalate. Can be installed indoors or outdoors and in Hazardous areas typically looking into a Div 1 area from a distance. Certified to FM 3260 for flame Detector performance. Analog stepped output and Alarm/Fault relays for simple connectivity. FSL100 maintains continuous internal health monitoring. Test lamps enable simple operational and Field of View testing. Allows the FSL100 to be installed and aligned covering the hazard. Covers the total FSL100 range, enabling fast checking of operational capability (included with Universal Charger and Carrying Case). Sophisticated software algorithms and dual microprocessors ensure that the FS24X has the highest fire detection performance combined with optimal false alarm rejection. Part of the FSX family of electro-optical flame detectors, the FS20X represents a quantum leap in integrating infrared and ultraviolet sensing technologies. Multi-spectral WideBand IR™, Near Band IR and Visible Band flame detectors are designed specifically for semiconductor Clean Room fire protection applications. A high-speed microprocessor based fire detection and process control system specially designed for liquid and powder coating applications, the FS System 10™ quickly detects the presence of a flame, reacts by initiating a shutdown of the electrostatic finishing process in a matter of milliseconds; and effectively interrupts the fire before residues and wet paint films can ignite.